There has perhaps been no creature that has had more of an impact on the world's fascination with dinosaurs in the past one hundred years than the Tyrannosaurs rex. A predator of unmatched ferocity and might, the T. rex has come to represent all dinosaurs in scientific discussions, pop culture, merchandise, and public perception. Aside from his strength and intense nature setting him apart from his fellow dinosaurs, there are a number of attributes that gave the T. rex the sobriquet of "Tyrant Lizard King". T. rex's serrated, conical teeth allowed it to dig into its prey's flesh, which it was able to tear about with its powerful neck muscles. 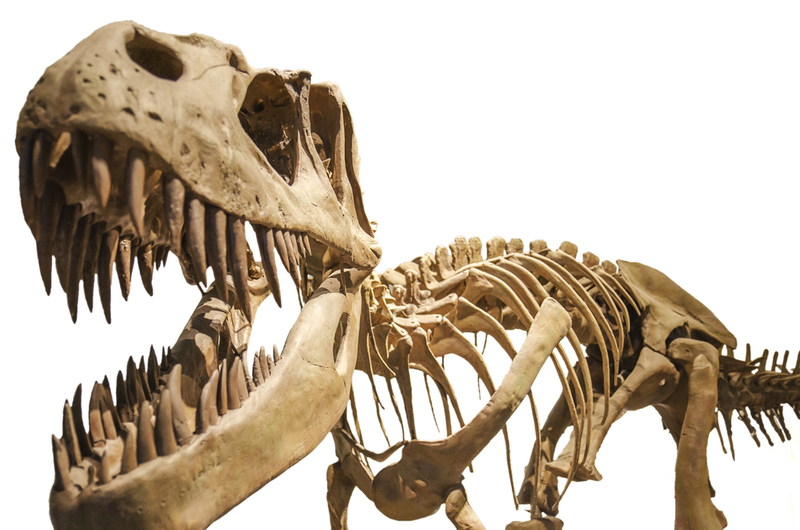 The diminutive arms of the T. rex were likely used to hold prey but lacked the ability to raise food to its mouth. T. rex evolved from smaller two-legged carnivorous dinosaurs known as theropods. Birds also evolved from theropods, which is why T. rex is more closely related to modern birds than to modern reptiles. Although paleontologists haven't found feathered skin imprints from T. rex, they are reasonably certain T. rex was feathered, at least when it was young. T. rex was the apex predator of its age during the Cretaceous period, until dying out 65 million years ago during the Cretaceous-Tertiary mass extinction. Henry Fairfield Osborn, the president of the American Museum of Natural History at the turn of the century, organized the initial digs that led to Barnum Brown discovering T. rex. Brown's first successful find was in 1900, when Brown excavated a partial skeleton of what would become known as T. rex in Eastern Wyoming. Osborn named this holotype Dynamosaurus imperiosus, mistaking it for the armor plating of another dinosaur. Brown discovered a second partial skeleton in the Hell Creek Formation in 1902, with Osborn describing it as Tyrannosaurus rex in 1905. Despite the earlier find this specimen would be the first documented discovery of T. rex. After further research revealed the two specimens were of the same type, Osborn was forced to choose between the two names. Though scientific convention typically dictates that the first name used is chosen as the primary moniker, a publishing error labeled the dinosaur as T. rex one page before that of D. imperiosus. This accident led to T. rex being known forever as the "Tyrant Lizard King". The Museum at Prairiefire's T. rex is a replication of the cast of the original mount displayed in the American Museum of Natural History known as AMNH 5027. This cast is actually an amalgamation of two of Brown's initial T. rex finds. The first specimen, the 1902 find that was first documented as T. rex, provided the pelvis, a single femur, one arm, and a shoulder. The second contribution to AMNH 5027 was from a 1908 find by Brown that consisted of the first ever complete T. rex skull, as well as most of the rib cage and tail. Owing to the differing sizes of the specimens, the 1902 holoype's legs were initially far too large to match the 1908 specimen's body. Despite its massive popularity, the true image of Tyrannosaurus would not be displayed until a restored version was unveiled in 1995. This version fixed many of the anatomical problems of Osborn's initial mounting. The body now crouched forward over the legs with the tail leveled parallel to the ground in order to provide stable balance for the massive creature. The bones were now scaled to their proper size with the legs now proportional to the body. Most notably, the new version of T. rex now had two claws on its hands opposed to the three that Osborn initially envisioned. AMNH 5027 was the world's first and most enduring look at Tyrannosaurus rex. Though it has been altered over the years for scientific accuracy its legacy will live on forever.